Swaraj Abhiyan leader Prashant Bhushan has claimed that the Delhi government has no intention of getting the Jan Lokpal Bill passed. "Government of India has been brought under the ambit of Jan Lokpal, which means the bill will not be passed. But AAP government will try to garner publicity by saying we passed it, now Centre has blocked it," alleged Prashant Bhushan while talking to Catch. 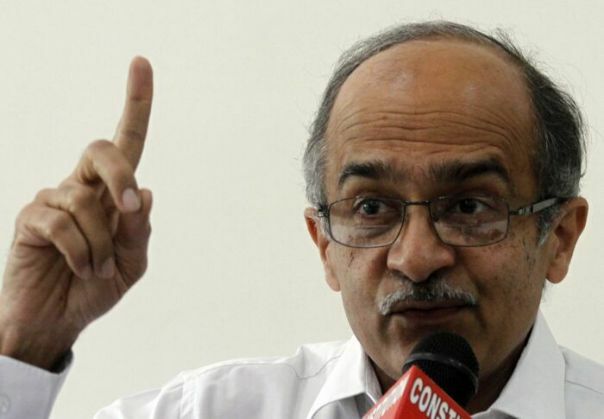 Initially, it was decided that there would be one Lokpal for Delhi and one for Centre, claims Bhushan. He further explains, "But Arvind Kejriwal has deliberately brought the Central government in the Lokpal Bill so that somehow it is blocked as there is a different procedure for passage of a Bill where Central government is involved." Bhushan claims that the Delhi government's new Jan Lokpal Bill is different from what was drafted during the Anna Hazare-led anti-corruption movement, as the appointment and removal of an independent ombudsman will now be done by the state government. The former AAP member, while talking to PTI, said the bill "thrashes" all the principles of an independent Lokpal and it is "worse than a Jokepal" -- a term used by AAP after the Centre passed its Lokpal bill. "Delhi Lokpal bill trashes all principles of an independent Jan Lokpal that we had drafted: Appointment & removal not under government; Independent Investigating agency under Lokpal. Saw shockingly dishonest Delhi Lokpal bill: Appointment & removal by Delhi Government; No investigating agency under it; Empowered to investigate Government Of India as well; Designed to fail! " Bhushan said on Twitter. Led by activist Anna Hazare, Prashant Bhushan and his father Shanti Bhushan along with Delhi Chief Minister Arvind Kejriwal and his deputy Manish Sisodia, were the leading figures in the fight for a Lokpal. Bhushan, who formed Swaraj Abhiyan after being expelled from AAP, said that the appointment and removal of Lokpal by the government itself fails the whole purpose. "The Chief Minister, speaker, the Chief Justice of Delhi and the Leader of the Opposition will choose a Lokpal. This means of the four, three are from political class and two (the CM and the Speaker) are from the ruling party or the government. The dismissal will be in the hands of the government as it prescribes removal by a two-third majority. Our fight was that the appointment and removal of Lokpal should be free from political interference," Bhushan said. He noted that under the original Lokpal draft, there was a demand to bring the CBI under the Lokpal, but under the proposed legislation, the investigating agency will be aided by the officers recommended by the Delhi government. AAP leader Kumar Vishwas has tweeted that nothing has been changed in the Jan Lokpal Bill. Manoj has worked for nearly all forms of media--print, tv, radio and digital. During the last 18 years he has worked for DD, Zee TV, Nepal 1, Sahara Samay, IBN 7, India News, News Express and Daily Bhaskar. He loves making documentaries and aspires to do a travel series for visual media. At Catch, he is part of the Speed News desk as Deputy Editor.